And you can spin the dial yourself to see whatever time block you’re interested in. So for instance it’s easy for me to give the dial a quick spin and see that it will be a delightfully cool 88 degrees at 10PM tonight here in Austin. And of course the three-day forecast thumbnails at the bottom right show me that Friday will be a mild 101 degree day here. How much are flights to Alaska? 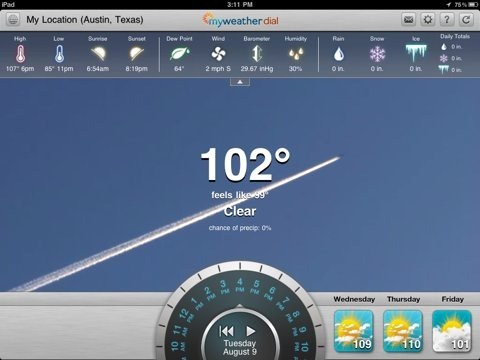 The app uses video and animation on its screens, as Weather HD does – though these animations are fun (e.g. skywriters criss-crossing the screen) they’re nowhere near as ‘pretty’ as the ones used in Weather HD. You can of course set your location, and also add unlimited locations via the app’s settings – so you can keep with weather in places where relatives live or vacation spots you’ll be visiting soon or wherever else you want to keep tabs on. When you first launch the app it prompts you to login to MyWeather or create a new account (email and password) to access locations on other devices – but you can skip this if you want. I like how clean and simple the app’s UI is. It presents a decent, basic set of weather information in a very crisp, clean layout. There’s a top bar that can be easily toggled on and off with one tap – which displays info like high and low for the day, sunrise and sunset times, Dew Point, Wind, Barometer, Humidity, and precipitation details. The dial is a nice idea too – it’s great for when you’ve got a particular event coming up and you want to see what the forecast looks like for when it’s happening. MyWeather Dial is a keeper for me. As I said, not quite as gorgeous to look at as Weather HD – but the dial feature and the app itself are fun and useful. 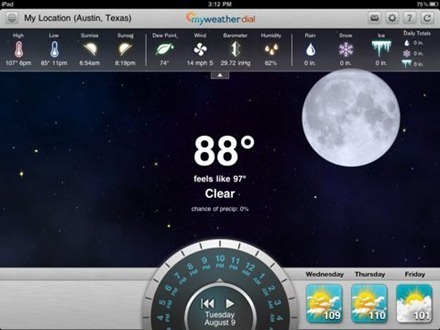 Here’s an App Store link for MyWeather Dial; it’s currently priced at $0.99, which is listed as 50% off as an introductory price. Note: This app runs on the iPad 2, not on the original iPad.